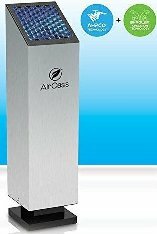 The Air Oasis G3 3000 Air Sanifier is the perfect unit for master bedrooms, open floor plan family rooms, offices, kitchens, nurseries and other spaces with moderate contaminants up to 3000 square feet. (The bigger the contaminant problem, the less square footage the unit can do. For instance, if you have new furniture or construction that off gasses VOCs, the G3 3000 might cover only 1500 square feet). Can be easily moved to spot treat other areas.. Remember, the Air Oasis G3 3000 works for rooms up to 3000 square feet with moderate contaminants. If you need a more powerful unit, check out the light commercial Air Oasis G3 3000 Xtreme or the Air Oasis 5000. If you have a smaller space to treat, like a bedroom or smaller office, the Air Oasis G3 1000 is a good choice, or for very small rooms like a child's bedroom or a nursery less than 250 square feet, see the Air Oasis G3 Mobile and Small Room unit. Or, if you are interested in a whole house model that works with your forced air heating and air conditioning system, see the Air Oasis G3 Whole House Air Purifiers. 11/24/2017 – It it effective dealing with cigar smoke? 2/5/2014 – how do I clean my purifier?